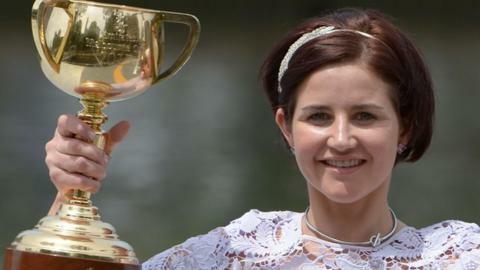 Michelle Payne, the only female jockey to win the Melbourne Cup, has been stood down from riding after testing positive for a banned substance. A urine sample showed the Australian, who rode at Royal Ascot last week, had the appetite suppressant Phentermine in her system when tested on 11 June. The sample was provided by Payne, 31, at the Swan Hill Cup meeting in Victoria. Racing Victoria stewards in Australia will hold an inquiry on Thursday. Payne has only just returned to Australia after she rode Kaspersky into fifth place in the Queen Anne Stakes at Royal Ascot on 20 June. She was advised of the test findings and stood down from riding in races and trackwork by stewards on 23 June. Payne made history in 2015 when she became the first female jockey to win the Melbourne Cup with Prince Of Penzance. After her victory, she made headlines with her comment: "I want to say to everyone else, get stuffed, because women can do anything and we can beat the world." Her life story is being made into a film, produced and directed by actress Rachel Griffiths, who starred in Muriel's Wedding and Six Feet Under. Payne made her Royal Ascot debut last week after serious injury ruled her out of the previous year's meeting. She required surgery on her pancreas following a fall in May 2016 and spent a month in hospital.